Essentially this book scared me. Every night I get into bed and read till I become sleepy. 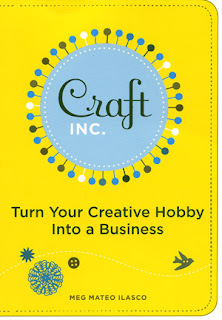 This book did not sooth me to sleep with dreams of happy crafting. Instead, I waited with baited breath for there to be a knock on my door in the middle of the night from either the IRS or Copyright Infringement authorities ready to confiscate my work and take me off to jail. They never came, but I took note. Though Ilasco writes a good book with great advice, the first half is for someone who wants to quit their corporate job and find some hobby they can make into a day job. She starts off for a chapter or so helping the reader find a craft that they might actually enjoy doing, something that might have marketability. Then she takes your entrepreneurial mind into the serious world of corporate legitimacy – taxes, business plans, copyright infringement, lawyers, essentially things that make me cringe. There truly is great information in this book for those looking for legal advice and the how-to steps to making sure their business is completely legitimate. She also has some great suggestions for marketing and publicity. As a reference book, Ilasco packs it full!